Relative lever lengths, mobility and stability characteristics will all play a part in each athlete’s perfect bar position. In general, the body bar system aims to stay as close together as possible. As a rough guide, encourage your athletes to position their feet so that when they look down from a standing position, the bar is over the first eyelet of the shoe. 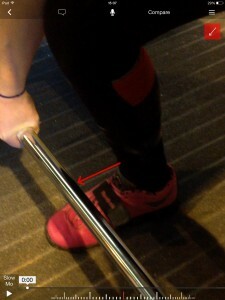 When the athlete then moves into the set-up position this should see the bar come close to the shin bone. Watch out for bar positions that are a long way from the shin bone when athletes are in the set up position (as below, Shin is pictured along way from the bar as highlighted). This could simply indicate poor bar position, and or poor movement mechanics requiring additional mobility and stability characteristics in that shape. If the latter is the case, i.e. movement related issues, start the first pull from some blocks whilst you develop more favourable set up characteristics. The goal is vertical force production so let’s use the position you create the most vertical force from. A hip to shoulder width stance maximises the opportunity of applying force to the bar over a greater vertical distance i.e. you can potentially get the mass of the bar higher into the air. 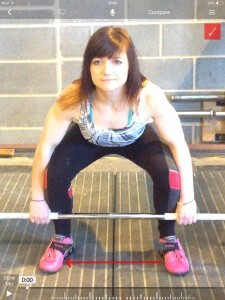 When coupled with a wider receiving position (squat position) you can move the bar higher and get under the bar easier. Adopting this changing stance width throughout the lift requires athletes to reset foot position after every rep (receiving / squat position back to jumping position) which in its self can reduce sloppy first pull positions on multiple reps. 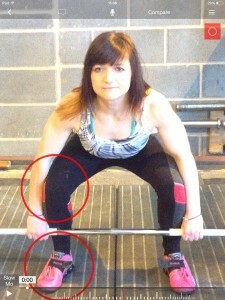 In the picture below, the athletes stance width is too wide and more resembles a receiving squat positions. Look for movement behaviours which do not maximise force production and therefore compromise optimal neuro-musculo-skeletal loading and exploding (lifting mechanics). Prioritise coaching based solutions first but be prepared to investigate the specific anatomical requirements if your coaching solutions do not improve the movement kinematics. In the picture below you can see the right foot has externally rotated (which may be coupled with evertion which cannot be seen with the shoe) placing the knee in relative internal rotation. This makes the set up possible but not optimal. Again if coaching doesn’t improve the set up position, raise the starting bar height whilst you work on additional mobility/stability requirements. Get a grip?! – whist looking at set up, we should briefly mention grip. This needs to be observed throughout the lift, but it seems appropriate to insert this small but important coaching point here – lets start as we mean to go on! Watch out for athletes over tensing their grips, arms and shoulders. Excessive tension in the arms and shoulders tends to lead to a dominance in upper body loading throughout the movement. Observationally during the lift you tend to see an early, dominant, deliberate shrug, often coupled with a slow turn over into the receiving position. Coach your athletes into a more relaxed position. Use a hook grip with enough tension to secure the bar. Have loose, soft elbows; let the hips do the work. Retract the shoulders to connect the engine of the hips to the shoulder girdle. Get your shoulder position right! In the picture below, you can see the shoulder is behind the bar and as a result the hip is also too low and not loaded enough prior to initiating the first pull. Traditional technique would see the shoulder in front of the bar to encourage loading of the hips creating a strong first pull and an optimal bar trajectory to complement the next part of the lift . Hope this helps guys… get lifting, get coaching!